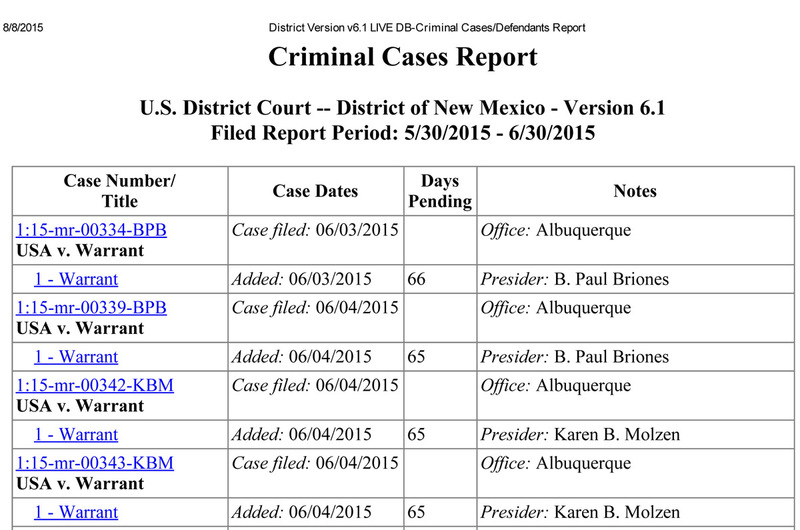 NM Cops and Courts Beat Guide | A guide for NM journalists covering the cops and courts beats. 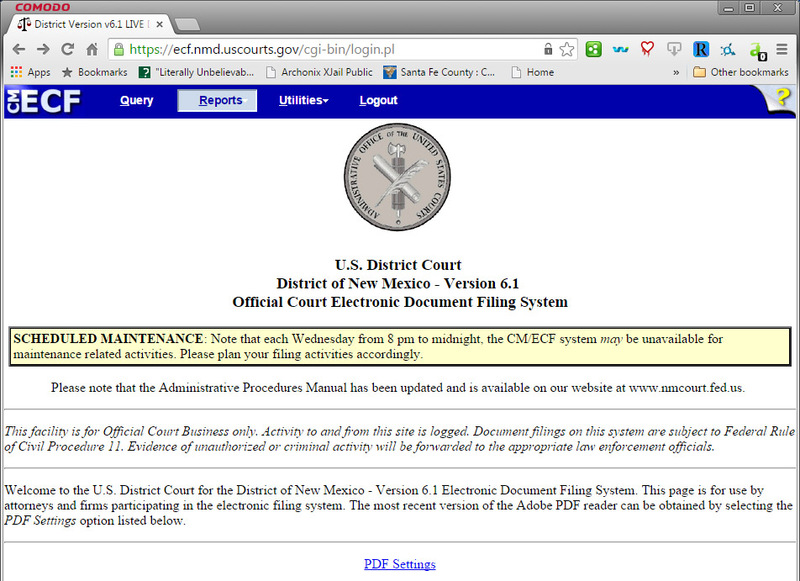 Welcome to landing page of the New Mexico Journalist’s Cops/Courts Guide. The guide is currently being developed. 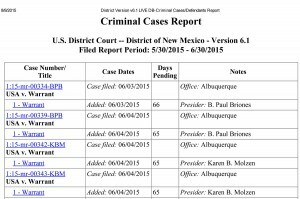 However, a few of the pages have been put up because they are ready to be viewed: mainly, how to search for federal search warrants in the federal district of New Mexico (in PACER). If you look to the sidebar, an index of the pages currently ready to view is also available. This includes a partial post on the law enforcement exemption in IPRA as well as a full post about requesting documents from private entities working “on behalf of” public ones. Also, see the NM government policy clearinghouse, here. The purpose of this guide is for New Mexico journalists to help each other cover the courts and cops beats in New Mexico by knowing where to look for documents, when to speak up and what our rights are as the media. The guide is very much a work in need of progress. Anyone interested in contributing, please contact me, Wheeler Cowperthwaite, at cowperthwaite at gmail dot com. I can use all the help I can get. Searching New Mexico federal search warrants requires a PACER account and a willingness to shell out some cash for unneeded documents. But, maybe we can change that. I’m currently hosting (on google drive) all of the federal search warrants (the dockets, the reports and the affidavits/applications) I download when looking to see if anything has been filed for my jurisdiction. If anyone has a better way to archive and share them, please let me know. I would like to make it as open and easy as possible. If you’re using pacer, you should have RECAP installed. (It’s PACER backwards). I find it works best on Chrome, although it also works on Firefox. It automatically uploads the document to the Internet Archive so whenever someone else looks at case file/docket you’re looking at, they can bypass PACER and download, for free, from the Archive. This also includes you, if you lose the document or can’t find it on your computer. There are two ways to search for search warrants. The first is the easiest, but requires running reports, which could (technically) cost well above the normal $3/30 page ceiling for charges on PACER. As an example, a civil case is usually numbered by: the last two digits of the year (15) – CV for civils – the number of the case here, such as 125. Example: 15-cv-00125. Criminal magistrate cases are MJ. Example: 15-mj-00125 or 15-mj-125. 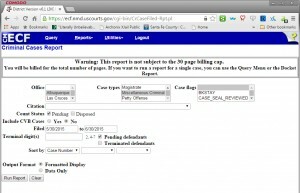 Criminal district court cases are CR. Example: 15-cr-00125 or 15-cr-125. The first method (for illustrated first method, see below). 1. 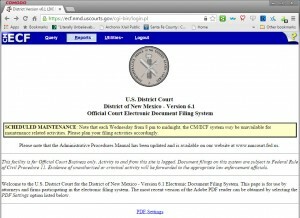 Log into pacer and go to the NM District Court. 2. Click on “Reports” at the top of the page. 6. Choose which warrant to view. The report should only show unsealed search warrants. 1. 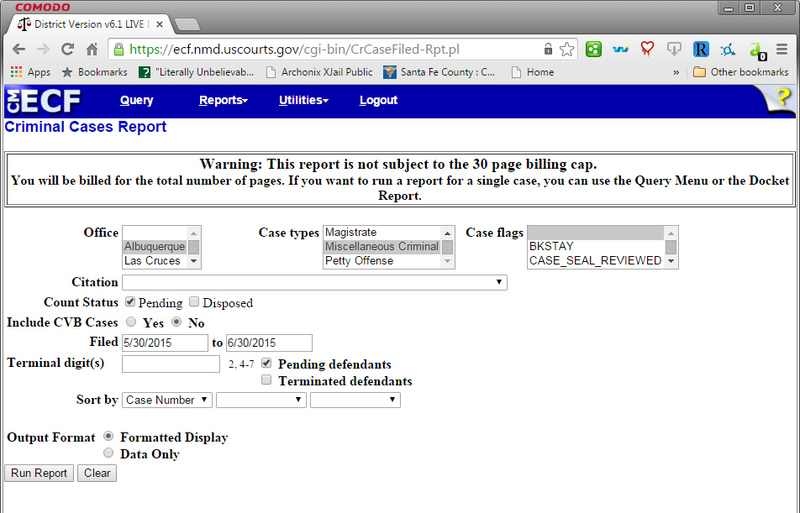 Go into PACER, NM District Court, and search for the year of search warrants you desire, using the middle letters of MJ. It should for 2015, start at 15-mj-00001. This guide, website and all the information contained therein is distributed under a Creative Commons 4.0 Attribution-Only license.